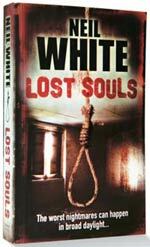 Neil White’s second novel Lost Souls deals with blood and gore and a lot more. This murder mystery is not for the faint-hearted. Children are abducted and then returned to their families days later, unharmed but with no memory of where they have been or who took them. Top cop Laura McGainty, who has moved from posh London to the Northern town of Blackley, needs to solve these cases without too much knowledge of the local police. Her reporter boyfriend Jack Garrett—the reason for McGainty’s relocation—is back in his hometown and finds himself entangled in two mysterious cases. And then Jack meets a man who ‘paints’ the future— prophecies of horrific events, which he then puts on canvas. Suddenly, it becomes clear that many people, including Jack’s own family, are in grave danger. Neil White deals with supernatural as a subject in his second novel—a thriller, which travels across England and deals with sordid tales as the key protagonists try and trace the elusive killer. White’s writing style is nothing unique and he does wander a bit sometimes, making the reader wonder whether he is trying to fill up pages. But the nature of the plot is fast paced and so, one is almost forced to turn the page. The story also takes potshots at the British police force and the corruption within the system. The story has the usual dose of terror, (ritual murders, gory details, the works) thrills, drama and some legal jargon thrown in—usually a sure way of ensuring readability. White has done a fair job, but then he has first-hand knowledge of crime and criminals, being a criminal prosecutor by profession. Born in a shoe shop (his father was a shoe maker), White spent much of his younger days flunking exams before reinventing himself as a solicitor in his 30s. His experience of dealing with hardened criminals and his obvious knowledge of the law makes this book not just a good (even if at times, disturbing) read but also increases the reader’s knowledge of British law and the psychology of criminals. This is for those who love a good murder story. Why do you paint your dreams? He looked embarrassed. ‘Because they come true.’ I laughed politely. ‘If only we could all say that.’ He shook his head. ‘No, not like that. These are bad dreams, and later on, they come true.’ He licked his lips and rubbed his forehead.